Vibrantly colored sugar crystals make these Rainbow Rounders as appealing to the eye as they are to the taste buds. The recipe is simple and kids have so much fun rolling the dough in their favorite colors. The brilliant element of this recipe is that it can be adapted to brighten any holiday platter. 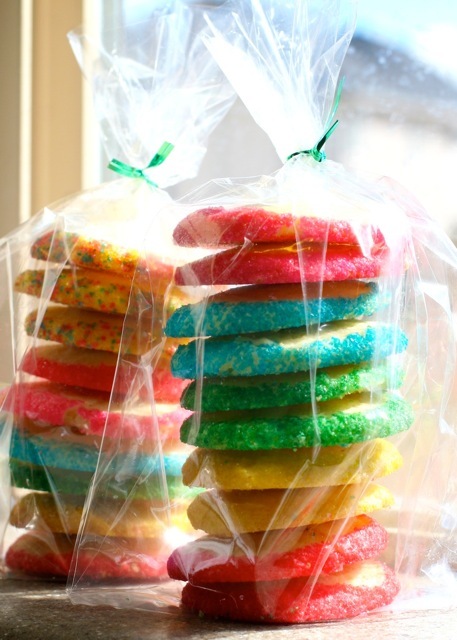 Use red and green sugar crystals for Christmas cookies, for a St. Patty’s day pot of gold coins, try yellow sugar rolled cookies, or use pastel colored sugar crystals for an eye-catching Easter goodie bag. Directions:In a large bowl, mix butter and sugar on high for 2-3 minutes, until light and fluffy. Add egg, yolks, vanilla, and salt; beat well to combine. On low, gradually beat in flour. Divide dough into 6 equal pieces. Roll each piece into a 6 inch log, wrap in saran wrap, and chill 15-20 minutes in the refrigerator. 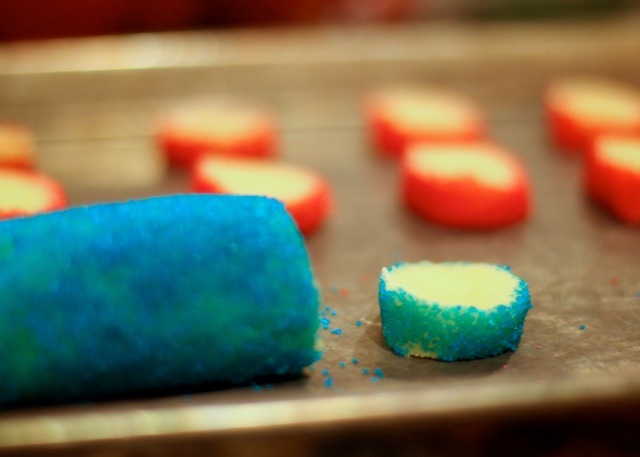 Roll one dough log at a time into one color of sugar crystals. Then wrap again in saran wrap. Continue until each log is rolled in a different color and wrapped. Refrigerate completed rolls for 3-8 hours. Cut logs into 1/4 inch thick slices and place on a greased baking sheet, 1/2 an inch apart. Bake 12-14 minutes, or until golden. Let cool 2-3 minutes on baking sheet then transfer to wire rack to cool completely. Repeat with remaining dough. Enjoy cookie time in the kitchen with the family and have plenty of pretty treats to share with the neighbors. Try decorating with all of the colors of the rainbow, the sky is the limit!